While America was exploring spirit and self through the Transcendental movement, Europe experienced a very different culture. The Romantic period ended at about the same time that Victoria became the Queen of England. Victorianism influenced literature for the length of Queen Victoria’s reign of more than 63 years. Intellectual and social advancement were driving influences during this time. The Victorian Period was “heavy” in expectations and affectations. Social status came with strict standards, a truism that fed the need to not only maintain status but also improve social standing. Standards were established for mourning with rules, timeframes and required dress based on the relationship to the deceased. The sight of a woman’s ankle was considered decadent and the turn of an ankle could do serious damage to a woman’s reputation. Charlotte Brontë is one of the most famous Victorian women writers. 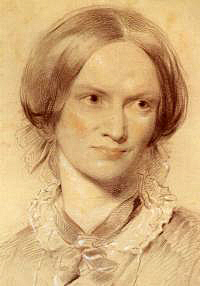 Best known for her popular novel Jane Eyre (1847), her first published work was a collection of poetry written by two of her sisters and herself. She submitted the poetry under male pseudonyms to improve the likelihood of publication. The Victorian culture viewed the writing of poetry as self-indulgent and potentially morally questionable, both rendering poetry as a financially disastrous endeavor. In addition, such activity was considered a scandalous choice for a woman. Social conventions could not stifle Brontë as writing had been a major part of her life since childhood. Following her mother’s death when Charlotte was five years old, the Brontë children created an imaginary town called Glass Town and wrote of the various adventures with depth beyond facts understood by their peers. Charlotte embedded poetry in her narrative works or presented it as songs performed by her fictitious characters. At times, the poetry is loosely connected to the plot as if she needed to share the poetry yet had no better place to insert the work. Charlotte was not a stranger to grief. In her short lifetime, she lost her mother and all five of her siblings before her 32nd birthday. As we can attest, intense emotion fuels creativity. The following poem by Charlotte Brontë contains many layers, from the state of being alone, the nature of secrets, how love leads to grief and how feelings change with the passage of time. On March 31, 1855, Charlotte Brontë died along with her unborn child. There are several theories and causes of death cited from different sources although her death certificate lists tuberculosis as the probable cause. She was 38 years old. Thank you for joining me for Pretzels & Bullfights for this glimpse of the immensely talented poet, Charlotte Brontë. Her life and work could fill volumes. I always feel that condensing the information of such great poets into a single article might be doing their memory a disservice but hope that with the tidbits I compile, someone might decide to explore further and get to know the poet in greater depth. I do like Georgette Heyer, but I never was able to wade through the long ones, prefering Victor Hugo or Dickens. Georgette Heyer – not a Victorian – was a 20th century historian who wrote light historical romantic novels to pay the rent! Her books are great fun, and bring accurate insight into the world of fashionable Regency England. Um! George Eliot (who was Mary Ann Evans), Beatrix Potter, Christina Rossetti, Charlotte’s sisters, Anne and Emily, Elizabeth Barrett Browning, to name but a few of the 88 pages of Victorian Women Writers named in Wikkipedia…. Most, of course, had to write under male pseudonyms if they wanted to be published. What a shame they didn’t have the outlet of blogging to share their work! Thank you, Claudia. I’m pleased you enjoyed it. I wonder if Charoltte would have made a greater impact in poetry if she had been male and if poetry had been financially lucrative. I already know a lot about Charlotte Bronte, and her siblings, in particular Emily. I was brought up on their novels! In recent years I also acquired a re-issues volume of their poetry. I think you have encapsulated the information very well here, with the emphasis on her poetry as befits a dVerse post. And you told me something I didn’t know previously — that incredibly condescending response from Southey. It makes me nastily glad to think that, although he had status in his day, posterity has not been kind to him and he is now considered a minor and mediocre poet. (Ha ha, take that, Southey, you misogynist prick!) But he was a product of his era, of course — unlike the Brontes, who transcended it. Given this incident, it seems particularly appropriate that you featured Charlotte so close to International Women’s Day. I have quite gone off Southey as a poet, after reading that letter of DIS-encouragement! That’s a good point, Beth. If there had been anything positive about women writing poetry during her time, perhaps we’d have not only more poetry from her, but also from other women of her era. I think poetry has the ability to cut through a lot of social fluff and get to the heart of the circumstances affecting people during a given time, for the sake of a better historical perspective of the lie and times of the people. I don’t believe poetry should have restrictions so I’m grateful to live in this era. A horrific story – thank you for the link. We Westerners tend to forget that we don’t all have the same freedom of expression and opportunities to be creative. I agree. Thanks for the wonderful comment. Beth, you do so much for us. I appreciate your thorough research! I love learning more about these poets. Thank you so much Beth – for this illuminating article and for all you do here at the pub. I had never read Charlotte’s poems so this was a first for me. I have read all the Bronte novels I believe and counted Wuthering Heights as my favorite novel for years and years. It was the first half I loved best and re-read it every so often. Of course, I read Jane Eyre and enjoyed the various movie adaptations of it. I knew their novels grew out of childhood games. I found that out after my children had become teenagers. I discovered that they named their game “little men” and I think the Bronte’s called theirs “little people” – both they and my children kept lengthy notebooks detailing the story lines because they had set the rule that once they “died” they could be revitalized in the story line. They actually buried their lego men and tiny toy men who played the parts. Weird to me then and now – but the Brontes went further and brought their characters to life in novels! Thanks again!! Thank you, Beth. My heart goes out to this young woman and all that she endured. It’s difficult to realize the degree to which women were (and still are in some ways) looked at as less capable than men. I admire her strength and fortitude to keep going in the face of such prejudice. So many stories there are of stifled women’s talents…and sad personal tragedies in their lives. With the internet, we can spread the truth faster and hopefully more accurately….time being a factor in studies these days. I thoroughly enjoyed reading this mini bio, Beth. I really enjoyed this post, Beth! You gave a nice insight into another side of Bronte’s writing. Thanks! There are those among us who are mutants. Charlotte was one of these. We are blessed by their presence, enriched in ways that define humanity. Why is that most poets have so much pain bottled inside them? The story of her death is so heartbreaking. Loved the poem… So tough for women in those time to be poets. Yet it’s inspiring that many made a mark for themselves. Yes, she was fascinating as person and writer and so was much of her family. The interesting thing about the times was that it did bring forth writers who saw, wrote, expressed albeit often with grace and subtlety, the wrongs of their time. That English reserve no doubt. Although Emily, her sister wrote with dark passion. Another writer of the times was Elizabeth Gaskell who was a social commentator akin to Charles Dickens. There is no doubt that the British (must include the Scots and Irish) stand out in the English-speaking world for their greatness with the written word. Is there a facility on this which will allow one to be notified of posts? I am six hours ahead of many posting in the US and nine for some – it would be good to have notifications arrive in my inbox. I do like to read what people write but have to remember to access the page. I too knew a little bit about CB, but you’ve added to that. Such a difficult life – all that loss. You chose the perfect poem to show that. And what a very strong woman, to carry on writing in the face of such discouragement. Thank you Beth. It’s sad that she lived in such a male-dominated time, but in spite of that, or maybe because of that, her writing is classic and still speaks to us today. Certainly a woman who inspired and paved the way for the future of female writers and poets. True talent cannot be stifled! Yet even in this day and age there are still some who believe a female’s place is in domesticity or labor alone, and not pursuing any other callings. Thanks for this enlightening and well-composed article, Beth. This is very interesting! A hard life has always been the birthplace to a creative world and with those times prevalent great artists arose only to awake the deepest feelings in our souls. For this i am grateful. Thank you so much for posting this! although i’m ashamed to say…i’ve never read any of her poetry and I love the poem! I will use the links provided and look her up! thank you! Thank you for this article, I had not before read her poetry. You took me back to my visit to the Parsonage in Haworth many years ago. Thank you, Beth, for this brief synopsis of the Victorian Era in British literature.